"It's an invasive species, and it shouldn't be here." The Lieberman family of Davie is hoping to get rid of a giant lizard that's been terrorizing their backyard. NBC 6's Amanda Plasencia reports. 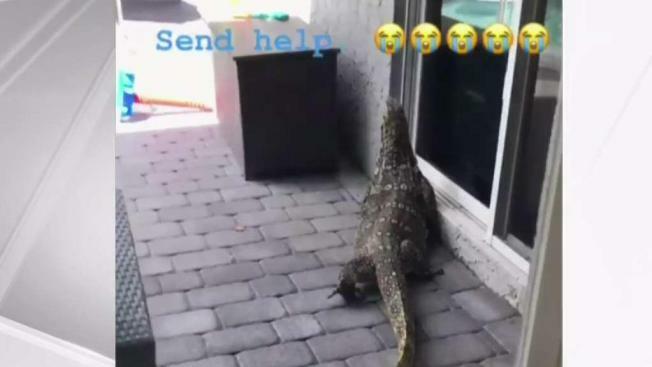 A Davie family has been desperately trying to trap a giant lizard that's been terrorizing their backyard. Maria and Zach Lieberman captured the brazen lizard on cellphone video slithering up to the sliding glass door of their back porch. "I was like, 'Oh boy. That's a big fella,'" Zach Lieberman said. Experts believe the creature may be an Asian or Nile water monitor, which is an invasive species to Florida. "It's an invasive species, and it shouldn't be here," said Mike Kimmel of the Martin County Trap and Wildlife Rescue. "It's dangerous to our native wildlife and it's dangerous to our ecosystem." Zach Lieberman first spotted the reptile a few days ago in the lush preserve behind their home, but they're worried their small children could be at risk. While experts say the monitors go after small prey, humans can get a nasty bite or scratch if they get too close. The Lieberman family also contacted the Florida Fish and Wildlife Conservation Commission for help the trap the lizard. "Everybody is trying to get it and get it alive," Zach Lieberman said.